One of Xiaomi's first takes at an Android Go Edition smartphone, the Redmi GO is modestly powered by a rudimentary 1.4GHz quad-core Qualcomm Snapdragon 425 processor and a dinosaur-esque 1GB-only RAM -- Android Go models usually run on low-class hardware cons, since the forenamed platform consists of stripped-down versions of essential Google applications and performance optimizations tailored to phones with low-class hardware components. Its processing specs also include a basic Adreno 308 graphics processor running at 500MHz. Adding to the lowlights of its array of pros and cons are an unassuming 8-megapixel main camera that's at least accompanied by a standard LED flash and a FHD-1080p video-recording mode and a 5-megapixel front-facing secondary camera that obviously will not put it alongside the best phones for selfies on the market. As for its pros, the Redmi GO boasts a 3000mAh battery that's hearty, at least when compared to the battery packs offered by a few other Android Go contenders featured here on Phonerated. 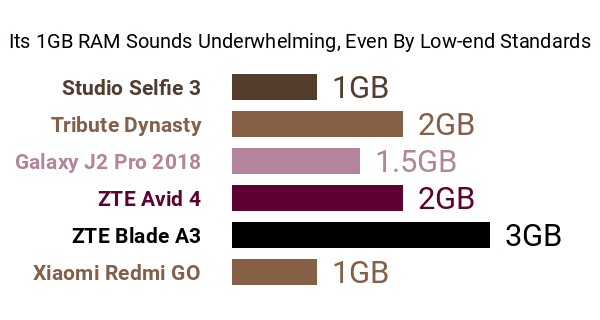 Also, as of this technical review, low-end phones with only 1GB RAMs and basic quad-core engines do not usually reach the 3000mAh threshold. In charge of the Xiaomi Redmi GO's multimedia storage is either 16GB or 8GB of internal memory accompanied by an up-to-128GB memory card slot . It also comes with two nano SIM card slots and it is equipped with dual noise-reducing microphones. This entry-level Redmi model's pros and cons are topped off by a passable (within the sub-$100 smartphone price group) 5-inch 16:9 display sitting on a 1280 x 720 HD resolution and a 380-nit maximum brightness level. It sports a metallic frame and it dons either a Black or a Blue finish. To rehash, the 2019 Redmi GO sounds like a solid choice for entry-level smartphone shoppers eying a model that puts efficiency above everything else.